Before Assistant Professor Joe Eaton joined the faculty at the University of Montana School of Journalism, he was an investigative reporter at the Washington D.C. based Center for Public Integrity, where he specialized in sifting through data to find stories of things gone wrong with America’s health care system. Today he passes his skill at investigations on to his students, but he hasn’t given up chasing his own stories. Above: Eaton’s article as it appeared in print. Photo by Andrew Graham. 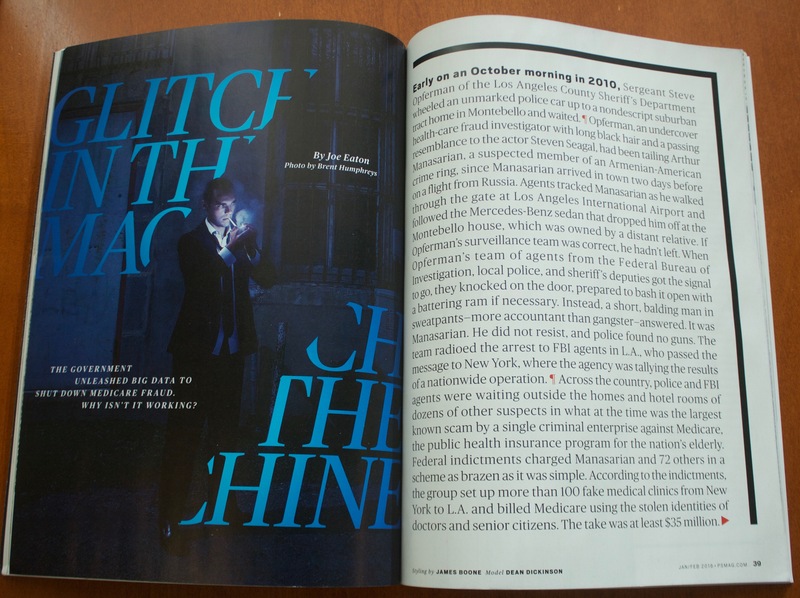 This January, a story by Eaton about the government’s inability to stop widespread Medicare fraud ran on the front cover of Pacific Standard, a magazine with national distribution that is based out of Santa Barbara, California. To get the story, Eaton relied on sources and knowledge from ten years of covering the topic. Eaton knew that scamming Medicare is relatively simple, given the scope of the program and the porousness of the review process for insurance claims. An expert Eaton quoted in the story estimated that the medicare fraud rate could be as high as 20 percent, of a program that spends $600 billion. When a 2010 bill passed through congress and mandated that Medicare follow the lead of the credit card industry and use big data tools to prevent fraud, Eaton’s ears picked up. “I wanted to take everything I know about Medicare and do a big story,” he says. When the government contracted the creation of the fraud detection system out to Northrup Grumman, a company better known for building airplane parts, Eaton suspected that he would soon have a story. Sure enough, when he later reached out to old sources in Medicare from his time at the Center for Public Integrity, they told him that an evaluation of the anti-fraud program had come back showing it was underperforming wildly. Eaton went to work. He wrote a story pitch in the hopes of attracting a publication – often the first step in a freelance journalist’s writing process. The pitch, he said, along with the story itself, seemed pretty dense for the kind of broadly read magazines Eaton had in mind. While he framed the story with the idea of Wired Magazine in mind, they didn’t bite on the pitch. New York Times Magazine liked the story but thought it wasn’t right for their audience. The Atlantic wanted it, but didn’t offer him enough money for the time and effort he knew it would take to write it. Finally Pacific Standard accepted the pitch, for the right price. Eaton started working on the story at the end of the 2015 spring semester. Writing and reporting it would take him all summer. As a long time investigative reporter, Eaton places high value on off-the-record sourcing, which can be essential for a story that casts doubt on the system and exposes mistakes by people’s employers. For this story, he said, there were twice as many sources behind the scenes as those whose names would eventually appear in the story. Many of them were sources in law enforcement, or amongst congressional staffers, who he has used over the course of his career. The result would grace the cover of Pacific Standard’s January issue. The magazine is a bi-monthly publication. It was Eaton’s first magazine cover story. Today, he remains in front of a class room, beginning a new semester with classes in editing, public affairs reporting and freelance journalism. He still keeps his nose to the ground for new stories, and is working on an expose of businesses scamming the elderly into buying gold that they may never see. That story will eventually run in AARP The Magazine. Eaton says it may be on the cover.